Have you ever made an offer to someone, then later wonder why you offered? A few weeks ago, I did just that. 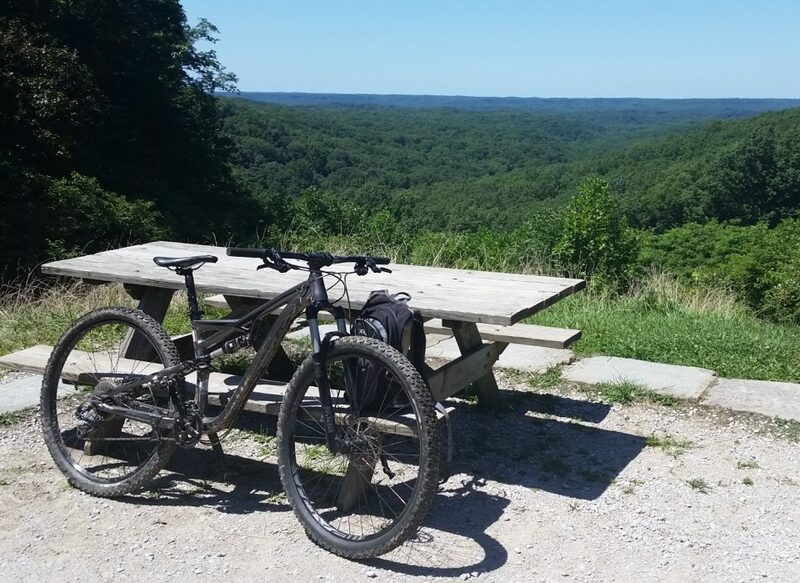 While commiserating with friends out in the parking lot after a seriously enjoyable single track ride, one of those friends shared that he is thinking about trying out road biking. He is one of those very young, enthusiastic and gifted guys who is overflowing with the joy he gets from riding. Deni is 18, just recently moved here from Bosnia with his mother, and when he started showing up at the trails, one of the regulars took him under his wing. The boy has learned fast, partially due to the youth factor — he is still too young to realize he is mortal and is not aware that mortality can be fleeting. That results in someone who will go full blast at any obstacle on the trail, a strength when riding a mountain bike (although it can result in injury, as well). Last August, I rode with him and another friend when he experienced the challenges of an extremely rocky and steep descending trail. We smiled as Deni relished that ride, exclaiming at the end that it was the most awesome experience he has ever had. Thus, we all like Deni. Being around him reminds me of what I once was or at least hope I once was. Deni waited on my lady friend and I a few weeks ago when we went out for breakfast. She liked him too, admired his good looks. The kid is tall, dark, and handsome. Her daughter would be very interested, according to what she said. He has that going for him, as well. Deni is one of those young men that you can’t help but want to help out. So, when he mentioned that he wants to try road biking but doesn’t have a bike, I offered to let him try my road bike for a while. I mostly ride dirt now. What could it hurt? I would want the bike back this winter, since it’s the bike that goes on my indoor trainer, but Deni was welcome to have it to ride for a while. Did I mention that my road bike is a very nice Serotta Legend Ti with titanium frame and carbon fork? It’s an older bike, but still a great ride. I was offering up an expensive piece of equipment. He came by my place a week ago, immediately went for a 30 mile ride. Judging from the texts Deni sent to me after his ride, the kid is already hooked on speed! While it was tough for me to give up the Serotta for a while, it is worth it if it means I helped a newbie get started in the sport. Here is a picture of my Serotta Legend Ti, taken almost two years ago. It’s outfitted the same now, with Look pedals, Shimano DuraAce rear derailleur and Ultegra front, Neuvation wheels, Ritchey compact cranks, carbon seat post. Friends occasionally ask me about what I do for a living, are a little surprised when I tell them that the company I work for is based in Budapest, Hungary. Where’s that? is a response that I have heard more than once. That gets a little chuckle out of me. Four years ago, I was not as familiar with the world outside of the USA as I should be. I am American, after all, and we Americans are not raised to think outside the American ‘box’ like the rest of the world is taught to think about the rest of the world. While Budapest was a city I had heard of, I would have had to look it up to know that it is in eastern Europe, although I remembered enough from geography to know that the Danube runs through the heart of the city. It’s not that I am not familiar with Europe. The company who employed me for 25 years before my current employer is a global company with offices and manufacturing in Belgium, Italy, France, Brazil, China, Canada. Until I worked for my current employer, though, I never had the opportunity to travel outside of the U.S.. It’s truly a wonderful opportunity. Opportunity called three weeks ago. An american company with large business potential was visiting our headquarters for a few days to test and talk about a product they want from us. With barely a week’s notice, I was asked to travel to Budapest to assist with negotiations. In addition, my “uniquely strong American” voice was required to record a number of product presentation videos for the company YouTube site. After checking the status of my passport, finding it needed to be renewed (and subsequently, expedited for renewal), I made the travel arrangements. My daughter, who recently moved to Turkey, recommended Turkish airlines, which offered one of the most affordable round trip tickets as well as the most desirable flight times. Had I used the least expensive airlines, I would have had to leave on a Saturday morning, arrive too early in Budapest the next day. Turkish airlines had flights leaving Chicago at 10 PM on Saturday evening, arriving in Budapest at 7 Sunday night. That would allow me Saturday to enjoy a final ride, plus it would be the best for handling jet lag as I could manage my sleep (i.e. not sleep). Jet lag was something I feared. Four years ago, the first time I traveled to Budapest, I suffered terrible jet lag for the ten days I was there, slept every other night and never enjoyed a full night’s sleep. When I returned to Chicagoland, I was a mess for the first few days back. This time, I managed to stay awake for the entire flight(s) to Budapest, did not sleep until after I checked in to my hotel room around 9 PM on Sunday. I slept like a baby the entire night, adjusted nearly perfectly to the 7 hour time difference the entire week. The hotel my company booked for me is cheap, the rooms small and spartan, typical of many of the hotels in Budapest. The small beds do not have sheets, only a mattress cover, and are not made. There is a duvet and a pillow cover. What you see in the picture is what I saw when I arrived. Rooms are not air conditioned and usually only have a small screenless window that hinges to open from the bottom out. Continental breakfast is provided, very good (better than most American hotels) with cold cuts, fresh cooked eggs, apple and peach juices, strong coffee, cereals, cheeses, fruit and yogurt. After my first night’s stay, I was transferred to the hotel’s “apartments” a few blocks away, a slightly larger room that included a shower that was actually large enough to turn around in, a luxury compared to the size of other showers I have seen on this and other visits. The apartments were new. Unfortunately, the two skylight windows in the room did not open, there was no air conditioning, and ventilation came from a small window above the shower in the bathroom. The weather in Budapest last week was unseasonably warm, so the temperature in the room was a bit uncomfortable at times, although tolerable. When not sleeping or bathing, I took advantage of the quiet courtyard outside the hotel as it was cool and comfortable there. It was in that courtyard I discovered that American visitors to Budapest are apparently rare. A large eastern European man approached me one evening, asked for a light for his smoke (unfiltered, as seems to be the norm), and laughed when I told him in english that I do not smoke. The guy had a five minute conversation with me, of which the only word I understood was “American-ya”. He repeated “American-ya” constantly, shared his “American-ya” acquaintance to everyone around us. I am not sure why he enjoyed it so much. At one point, he moved closer to me and made a gesture with rounded lips — which really creeped me out! The total cost of the hotel for the week? 60,000 forint. In U.S. dollars, that’s around $215. My bag arrived in Budapest a day after I did. It was delivered with a plastic zipper lock, courtesy of airport security. I picked my bag up at the hotel, pulled my bag the three blocks from the hotel to the apartment, only to discover the plastic zipper lock prevented me from opening my suitcase, pulled the bag the three blocks back to the hotel as I did not have anything sharp to remove the plastic lock, then returned the three blocks to the apartment. By that time, my driver for the week was waiting to take me to meet my clients and our host for a dinner, that evening at a lake side restaurant near Heroes Square and the hot spring baths that Budapest is known for. It was Monday and I was still wearing the cloths that I had left Chicago in, had not shaved yet and felt a bit funky (but not ready for funky town). I was busy the entire week, my days spent at headquarters, usually followed by a brief return to the hotel to freshen up, then an evening spent with host from my company. I ate one evening on a boat moored on the Danube with a spectacular view of the King’s palace, parliament, and several of the bridges that cross the Danube. The next evening, I was treated to dinner at an outdoor restaurant that faced St. Stephens basilica, a truly magnificent and beautiful building. We went inside the spacious basilica after dinner and were treated to a lovely acoustic guitar concert. My week’s entertainment concluded by dinner with the fun associates of our marketing department, who had served as the film crew for the two days of video shoots, at a craft beer restaurant called Steampunk, followed by a visit to a craft beer festival in the heart of Budapest. The week had a rhythm to it, as each day began with a relaxed breakfast in the downstairs dining area at the hotel, followed by a drive through Budapest to the office, work (the days were busy, fast moving), lunch at the VIP table in the company cafeteria, a short time of freshening up at my hotel, then dinner in Budapest. Eating lunch at the company cafeteria was always interesting — some form of goulash with fresh cut tomatoes/cucumber on the side, meat with potatoes, dessert (I preferred the fresh hungarian “donuts”), then cappucino. There was always more food than I needed. I was treated like a very welcome guest all week. Perhaps my favorite moment of the week was lunch with the man who serves as my primary day to day contact every day, Peter. We have become friends over the years and it showed in our conversation at lunch that day, which was my last day of my trip to Budapest. We had spent much of the day talking about business, so lunch was a time to catch up personally. He was suffering through the last days of his father on earth, had spent the week at the hospital with his father. My recent experience with the loss of my mother was something he wanted to hear about. As we left the lunchroom, Peter put his hand on my shoulder and told me if it were not for the ocean between us, I think we would be best friends — we are already very good friends despite the distance. He meant it, as it really is very true. During the whole week, I felt the same kind of fondness from the people I dealt with. It truly was a very good week. My time there ended with an offer for to consider from the owner of the company, something I will have to consider with some seriousness for the next few years, an offer that also demonstrates the reputation that I have with my partners in Budapest — a very encouraging thing indeed. My return trip home was a long one, a flight from Budapest to Istanbul that arrived in Istanbul at 11:30 PM. My connecting flight to Chicago O’Hare would not leave until 2 PM the next day. I spent the night and following morning in the Istanbul airport, an interesting but long time to spend in a strange place. I chose to stay awake until 6:30 AM, then curled up in a chair in the middle of the airport for a deep three hour sleep. I enjoyed a Turkish breakfast in the airport, as well as lunch. The flight from Istanbul to Chicago was nearly 11.5 hours, of which I fought the temptation to sleep, watched four movies to keep awake. I arrived home at 8:30 Saturday night, showered, changed clothes, then picked up my girlfriend. She went home with me, snuggled up next to me, watched me sleep…. Life is interesting, especially when it extends outside of the normal sphere of existence.